"An assassin’s loyalties are always in doubt.But her heart never wavers. A book that’s greater than it’s predecessor! 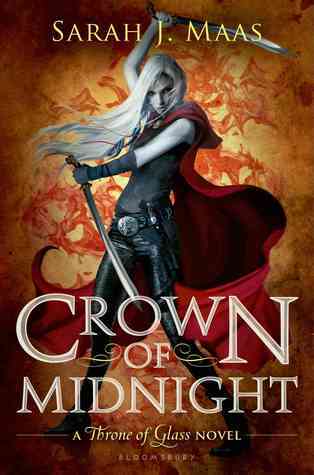 I loved Throne of Glass, but I really loved Crown of Midnight with it’s fantastical adventure, action and turn of events! Celaena now works for the King and must do any and everything he says, but is he really the worst problem to worry about? Change is swirling throughout the kingdom, and magic is reawoken, and not just in the usual suspects. Power is rekindled in the most unsuspecting people. Dealing with her past regrets and troubles, Celaena must start to come to terms with not only her parents death, but her love Sam’s death, to finally accept who she really is. Just when she starts to open up and let someone see beneath her veil, she is faced with betrayal and regret yet again, which flips a switch within her to start to really do something about the tyranny and dark magic happening in the kingdom. I really enjoyed the character developments, as well as the plot developments. The author wasn’t afraid to delve into the characters psyche and put them through emotional trials. It’s time for Celeana to truly embrace the assassin she is and not to let people, or her emotions get in her way. She must find a way to The ending, however, was not very surprising for me, though it does leave a nice cliffhanger. The clues placed throughout these first two books really solidified the revelation that the ending shows us. I look forward to reading the third book to find out how Celaena’s plan pans out. Is leaving really the solution to help the kingdom? We shall see!